Okay folks, here is the link for the business cards. Please read the instructions that Spring has posted and it's easy to do. Good luck and Thanks for promoting Sjogren's World! Pooh, I have just completed printing out 20 business cards and I feel so blessed just to be able to hand these out to my friends, family, dentist and rheumy that I would love to make a donation to Sjogren's World. This is such a huge service for us and will be such a help for everyone who has people who do not understand what we have to deal with! Thank you Katie for your kind words. 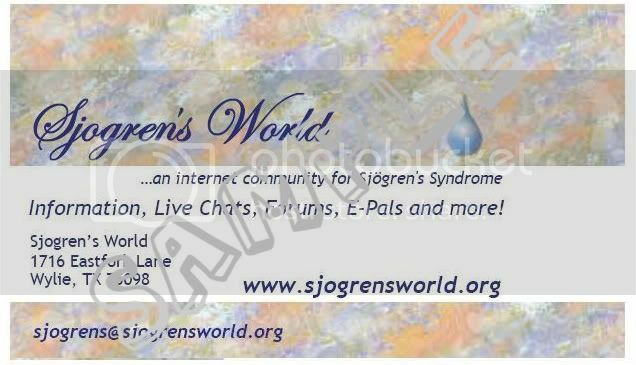 If you would like to make a donation to Sjogren's World you may go to http://www.sjogrensworld.org and choose which way you would like to do so. Any amount is most appreciated. Thank you Pooh. I clicked on the link and printed out directions...(if I only had a brain..) It may be a couple of weeks before I can say "the check is in the mail" but I fully intend to make a good donation. Thanks Katie, we appreciate any and all donations we receive. In order to maintain this site and the chatrooms it does take a little money. Not to mention the program upgrades. We have a fantastic group of volunteers who do what they do so expertly that it seems to run itself. But it doesn't. Without our members and their support, plus the support of the staff, I can't imagine where this would all be. It just goes to show what two determined ladies, (as sick as they were themselves) can do when there is a need. Thanks to all who donate their money, time and knowledge to us. Hugs, The Staff at Sjogren's World! And big, big hugs and thanks to all of you who have made my life so much more bearable since getting this diagnosis! I don't even want to think of how lost I'd have felt had I not found this site! Just want to let you know that i'm seeing my immunologist on Monday. I've printed out some business cards and am going to see if i can leave them at his office. I'm sure that will be fine cause he's a big believer of support and education. thank you so much guys for providing this invaluable support. it has helped me so much. And even if it works out that i don't have sjs i'll still be around cause i can relate to so many of you symptom wise and on a personal level. keep up the great work. I don't have a lot of time but if there is anything i can do to help you guys out let me know I'm more than happy to pitch in. I'm hoping to get a donation sent very soon. For the kinds words. It was so nice to have you in chat tonight. Please try to come again. I think that someone may have damaged the file. The 3rd row of cards has some foreign characters in it. I just tried it and it's okay for me. When I first logged in to it, the print was strange but it quickly cleared up. Have you tried again? I will report this and see if maybe someone has tried to mess with the file. What is the heading on the top of the business cards. I could be wrong but im sure it doesn't say sjogren's world. Is this what we are printing out? This is a sample of what the cards will look like. The download has 10 on a page, and you have to follow the cutting directions to separate them after you print the page, but each card should look like this when done. Its just that when i clicked on the link before and the cards came up it didnt say sjogrens world at the top it had some weird gobbydt goop. its fine now tho i have it. Thank you... I have been so lost for so long and finally found this site and feel like I just hit the lottery with ya'll. I have like no money literally but my bf does and I will ask He is such a kind man... Then again when people say they have "no money" just go look in the couch for change, I'm sure every little bit counts! I am going to go look in the couch, loveseat and chair!